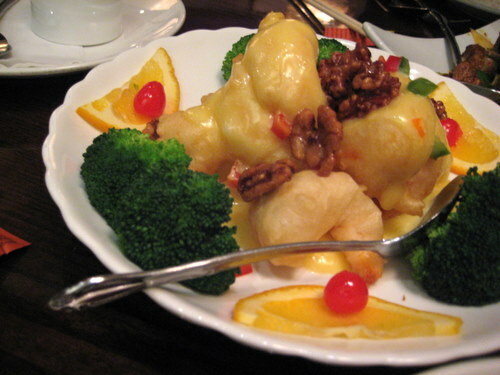 We’d been trying to get out to Han Dynasty for what seemed like months. But trying to coordinate schedules around the holidays can be rough. But we finally made it out to Royersford the other night to eat some tasty chinese. It’s in a nondescript strip mall. Once you get inside it though, you notice something immediately. The place is a carbon copy of Sangkee Asian Bistro in Wynnewood. I mean seriously. The layout is the same, the floors and tiles on the walls are the same. The table layouts are the same. They have the same bar with the tv’s. They have the same waiting area. It’s an exact copy. The only difference is that there are no persian rugs on the walls at Han Dynasty and the light fixtures are different. That, and of course, the food! 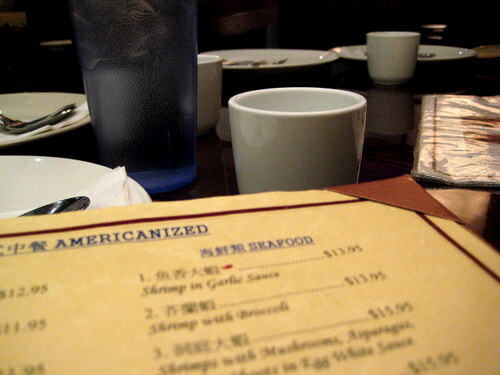 This place cracks me up because they have an “americanized” section and an “authentic chinese” section in their menu. How great is that? We ordered everything from the “authentic chinese” side. And everything was ordered in chinese by our two chinese speaking dining companions. It was awesome to witness. I had NO idea what was being ordered, and I loved the mystery of it all! So, here we have the mystery dishes. In the front is some kind of beef with hot sauce. See all the crushed red peppers on top? Yes, this dish was hot. There was also cabbage under the beef. Loved this. I especially loved the cabbage! Behind that is double cooked little pork riblets with leeks and black beans. Not spicy here, and quite delicious. Ok, we are moving over to seafood now. 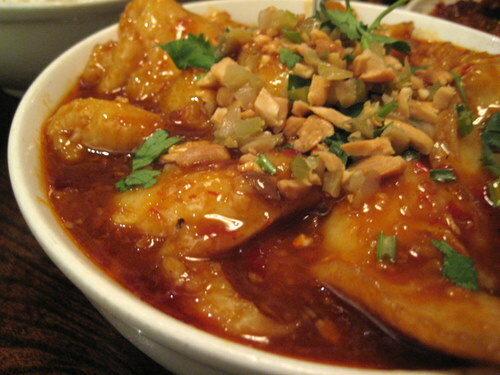 Sliced fish with tofu in wild pepper sauce. Spicy and awesome! 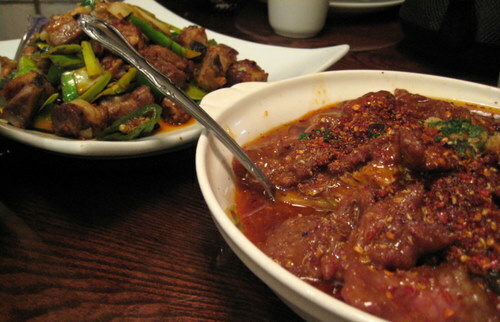 But spicy in a way completely unlike the beef dish. So nearly as hot, but the taste was very different. And I loved that. H/A selected this next one – the mayonnaise shrimp, or “hup toe ha”. I’m not sure if this was even on the menu, but he ordered it anyway and it showed up! It’s battered large shrimp served with a sweet mayo based sauce. It’s quite good! 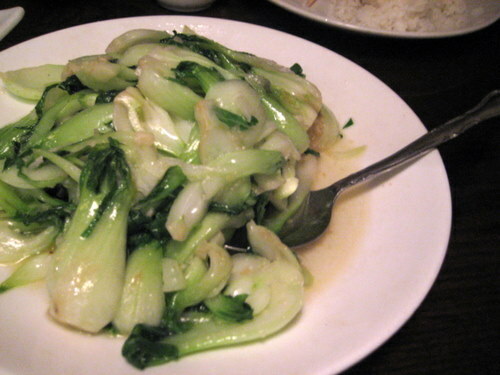 Last, but certainly not least, the baby bok choy in garlic sauce. We wanted to get the chinese okra, but they were out of that, so we just got them to make it with baby bok choy instead. This was beyond good! It was super garlicky and just perfect. I love simple veggie stir-fry dishes like this. Service was good. After we ordered the food, it came out super duper fast! And they let us take as long as we wanted. We were there a long time, so long that everyone from the kitchen eventually came out to the dining room to have their own dinner! E said that chinese restaurant do not close until their last customer has left. I think we may certainly have been there beyond their official closing time, but they did not kick us out! And I can definitely appreciate that. I love chinese from my neighborhood take out place as much as the next person (shout out to Pak Yue!) but eating this type of authentic cuisine is so much better. I wish I could do this at every ethnic meal! Everything is ordered in the country’s native language and I have no idea what I’m about to eat. And then I just get to enjoy it!